March 2014 – Under Every Leaf. First up is an apology for the lack of posts recently. Unfortunately real life has conspired to keep me from writing and even researching has been tough. I now have plenty of time on my hands so hopefully you should see an increase in posts which I hope you enjoy. Recently I have been researching the British armies Balloon Corps which was sent to South Africa at the start of the 2nd Boer War. Originally the preserve of amateur aeronauts the first British Army balloon was built in Woolwich Arsenal by Captain J.L.B. Templer. Balloon pioneer, Captain J.L.B. Templer. He built the balloon, Pioneer which was made of specially treated and varnished cambric, and cost £71. It was the first balloon built by the RE at Woolwich. Therefore it was the first British Built Military Aircraft. The first flight was on the 23rd August 1878. 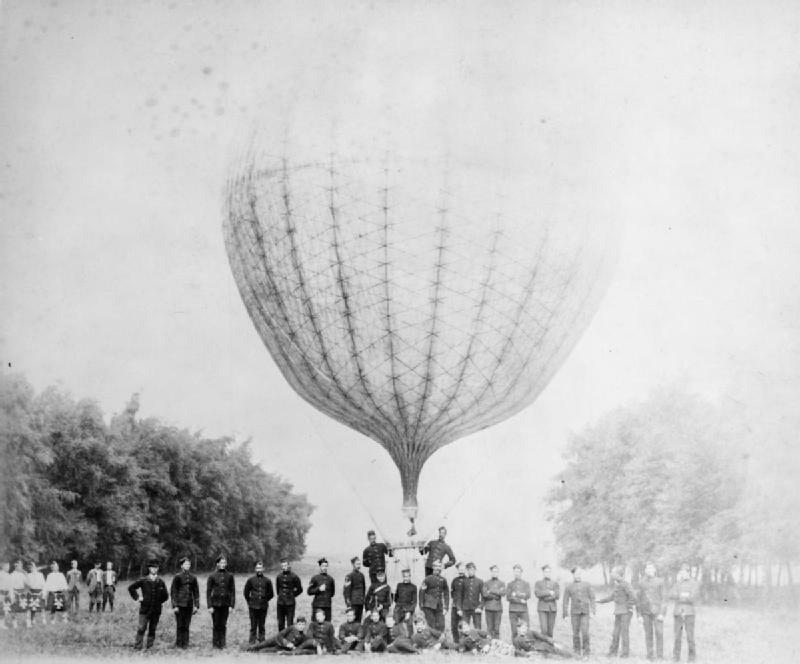 The Army began military balloon training in 1880 and moved the unit to Chatham, Kent. 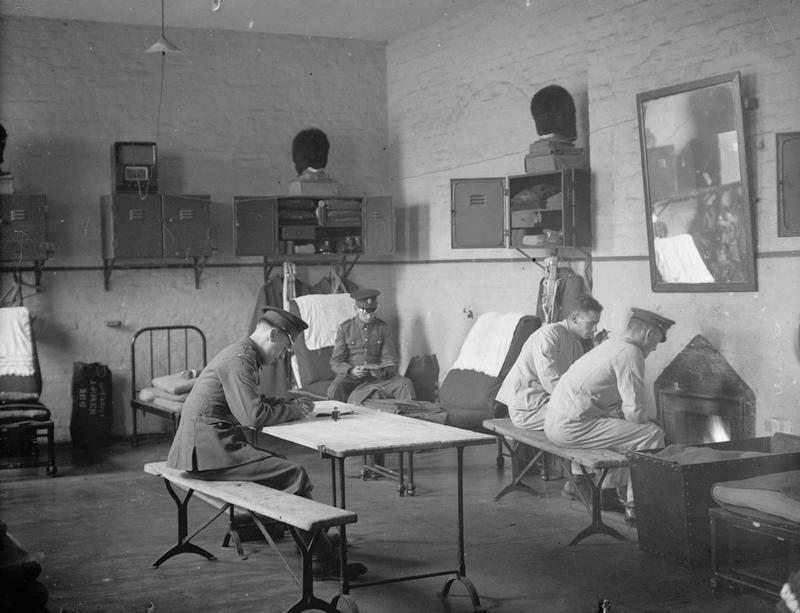 By 1890 the British government has recognised the importance of the Balloon Corp and had moved it to larger quarters in Aldershot and brought the unit into the British Army establishment. 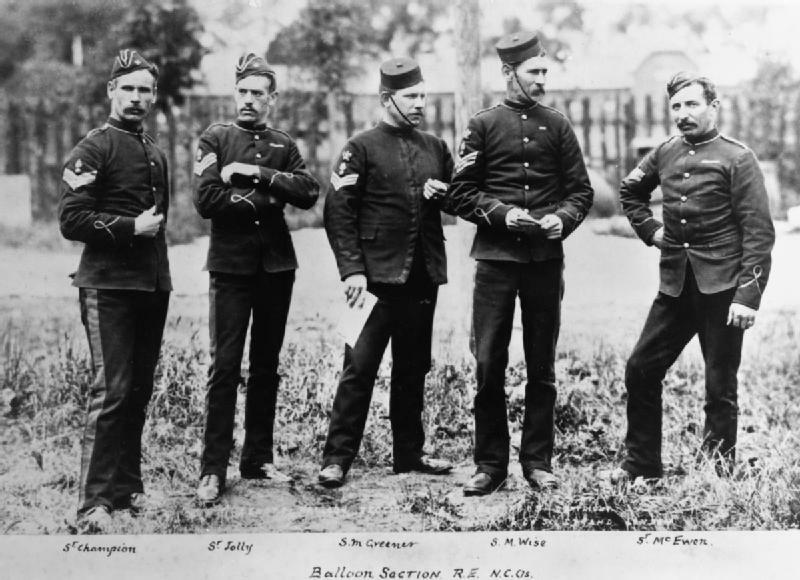 While researching the Balloon Corp, I came across this great picture of the NCO’s of the Balloon Section RE. As you can see the men are named so I set about to see what I could find out about them. 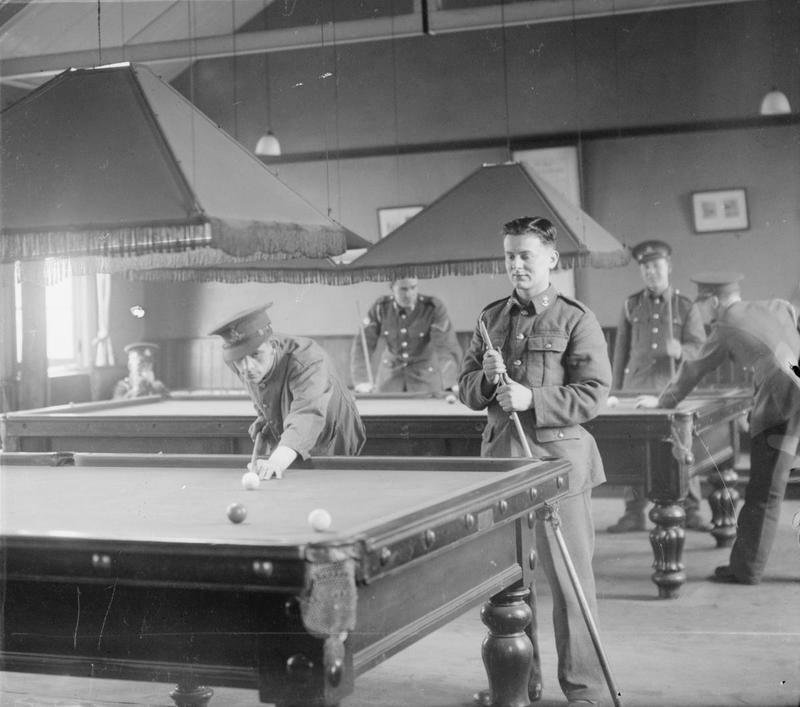 Using http://www.findmypast.co.uk/ I first tried to find their service records, for Sgt Maj Champion, Sgt Jolly, Sgt Maj Greener and Sgt Ewen as expected this drew a blank. When I added Sgt Wise into the search engine amazingly I got a hit. It is quite rare to have a picture and a complete service record for any solider, especially from pre WW1 so this got me quite excited. 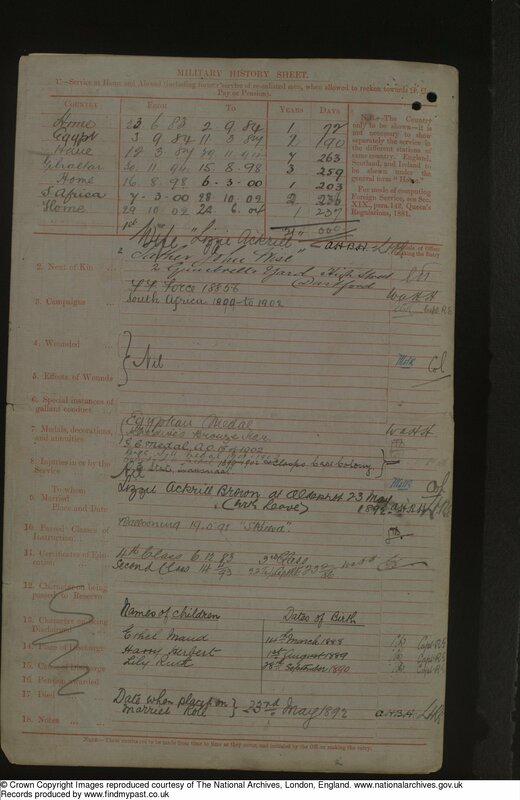 Using his service record I could then find his birth index, census records, Marriage and finally death index. This is what I found out. James Wise was born in Dartford, Kent 1864 to Charles and Jane Wise. His father was a gardener and he was the youngest of 4 children. 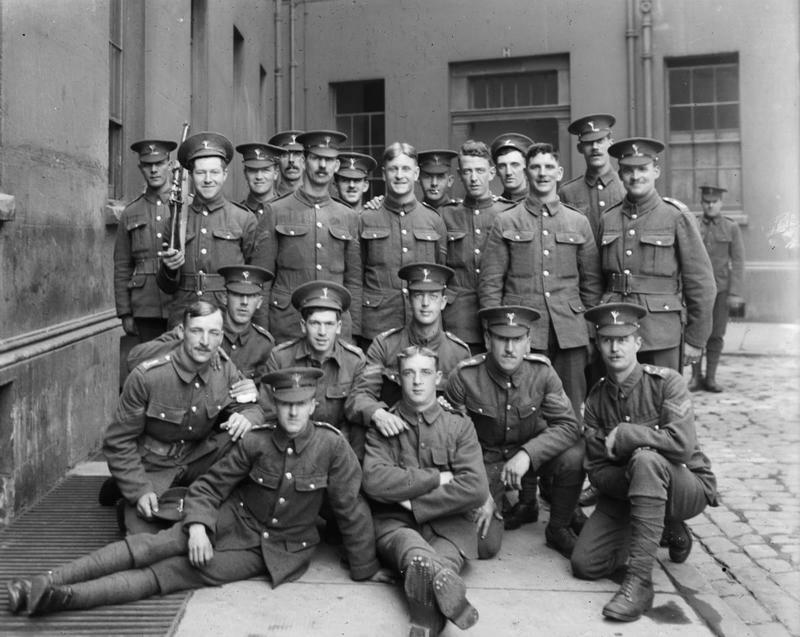 When he finished his schooling he became a General labourer until on the 23rd June 1883 he joined the Royal Engineers as a Sapper. 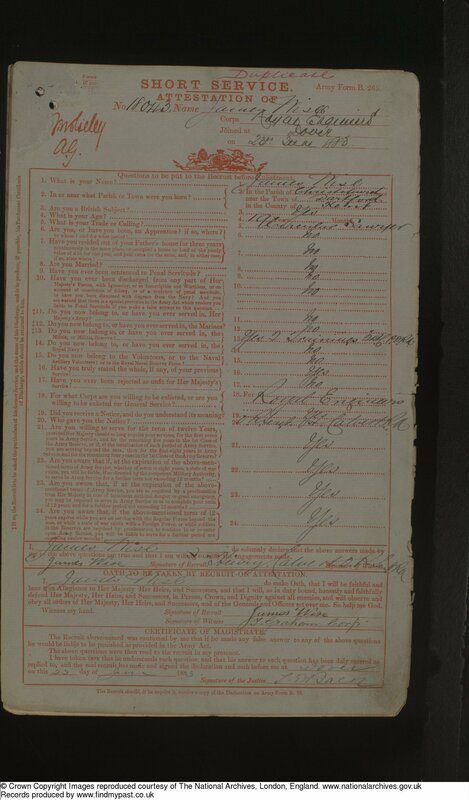 James Wise’s original sign up paper. Sergeant 1/1/1900. (even though he is listed as Sgt Major on the picture it isn’t listed on his service record). On the 19/5/91 he was listed as skilled Ballooning which earned him extra pay. He spent the first 15 months of his service at depot but in September 1884 he was posted to Egypt. He served for just over 2 years in Egypt for which he earned the Egyptian medal. 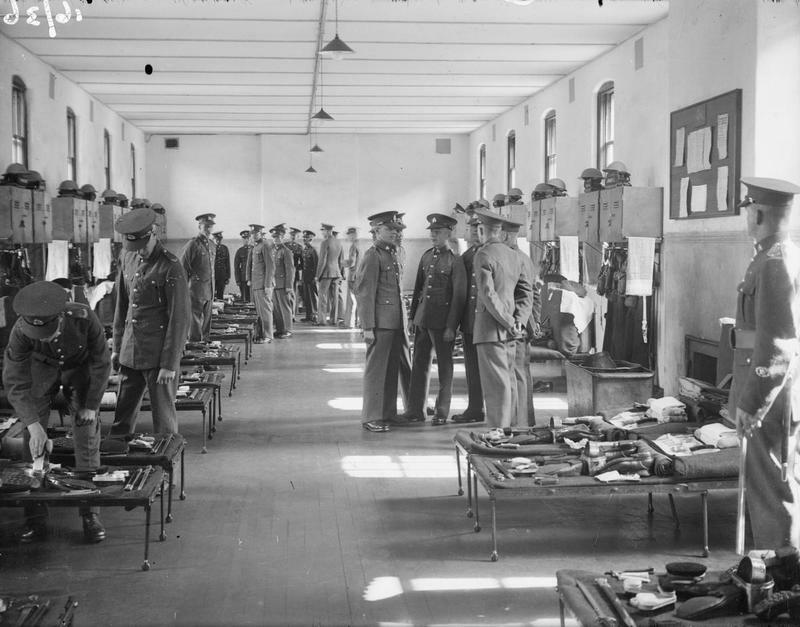 He also saw service thought out the 2nd Boer war in South Africa and was awarded the King’s SA medal and also a Good Conduct award. He married with permission, Lizzie Ackrill Brown on the 23rd May1893 in Aldershot and went on to have 4 children with Lizzie. 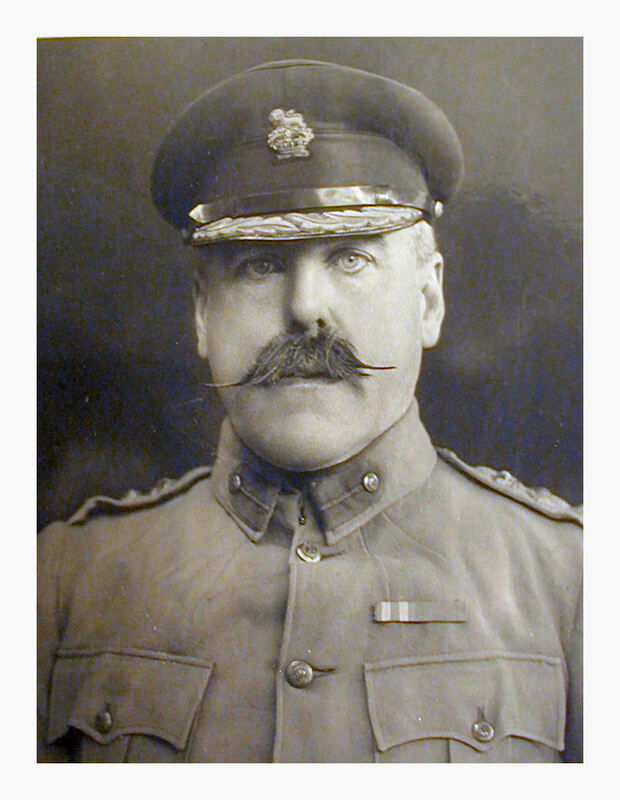 He retired from the Royal Engineers on the 22nd of June 1904 after 21 years exemplary service. He originally retired to Chatham Kent but by 1911 was living in Channing town with Lizzie and the children. Sergeant-Major James Wise (retired) died in Channing Town in 1926. An’ I’m learnin’ the damned old goose-step along o’ the new recruits! ‘Ow did I learn to do right-about-turn? Beside “Reserve” agin’ him — ‘e’d better be never made. An’ I thought of ‘Er Majesty’s barricks, an’ I thought I’d go an’ see. When me an’ the other rookies come under the barrik-gate. ‘Oo would ha’ thought I could carry an’ port? I took my bath, an’ I wallered — for, Gawd, I needed it so! I smelt the smell o’ the barricks, I ‘eard the bugles go. ‘Oo said I knew when the troopship was due? I carried my slops to the tailor; I sez to ‘im, “None o’ your lip! But I thought you was used to the business!” an’ so ‘e done what I said. An’ — any pore beggar that wants it can draw my fourpence a day! In learnin’ the others their trade — parade! An’ back to the Army again!